Portion control is often key to maintaining a healthy weight and reducing the risk of chronic disease. We’ve all heard about the many benefits of a healthful eating pattern that incorporates proper portion control. Making portion control something that is accessible and appealing to your clients, on the other hand, can be more of a challenge. 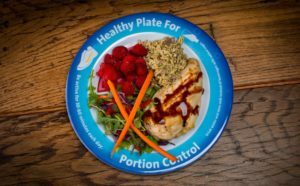 That’s why my team and I created these beautiful portion control plates! We designed these plates to help consumers stay on track when it comes to maintaining a healthful diet, practicing portion control, getting regular exercise, and staying hydrated. By using this plate to dish up their meals, people can save up to 60% of their daily calories per meal (compared to just loading a plate by eye like most people do). 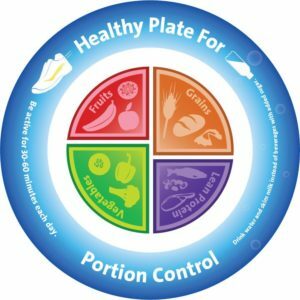 This plate keeps foods in the proper proportions and portion sizes, as recommended by MyPlate. Meanwhile, the rim of the plate is full of reminders to sip the right kind of beverage and get moving from time to time! The beautiful color pattern of the plates makes them attractive for home, picnics, the office, and parties. Plus, they work beautifully in wellness fairs, cooking demos, classrooms, and one-on-one consultations. 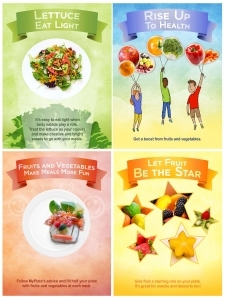 To celebrate the release of these wonderful nutrition education materials, I want to share two activities that you can do with these plates today! Assemble your group, pass out the plates, and make sure everyone has access to scissors and magazines. Explain that they are going to cut out pictures of food and then sort them into the appropriate areas of the portion control plate. Offer your participants some time to cut out their selections, then explain the next part of the activity. Pick a food group and call it out. 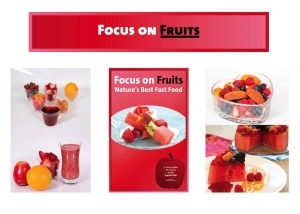 The participants must find a food that fits into that group (from their collection of magazine images) and place it on the correct section of the plate, holding up both the picture and the plate so that you can see it. Award points for speed and accuracy, correcting any misconceptions that may crop up. After the game is over, you discuss the results and let the class go or add a twist. For the latter, see who can find the healthiest food to fit in a food group the fastest. Discuss. What makes each food a good fit for its food group? What nutrients does it contain? How much saturated fat, added sugars, or sodium is in the food? Pass out the plates to each participant. Give everyone pens and pieces of paper too. Have everyone examine the food groups on the plate. What are the portion sizes like? How do the proportions work? Discuss what they notice. Have people list the days of the week across the tops of their papers. Using the plates, have them plan meals that would fill the plates in the proper portions for breakfast, lunch, and dinner on each day of the week. Once everyone has their ideas mapped out, ask for volunteers to share their plans. What inspired them? Why? Which ideas are the best for a healthful eating pattern? What makes them healthful? Once your discussion is finished, let your participants keep their plates, and, if you’ll see them again, check in on their progress. Do they like using these new plates? Why or why not? I hope you liked this resource spotlight! Here are some other great portion control materials — which will make your life easier? Portion Control Banner 48" X 36"
When I travel, I love to check out what the locals are eating. One way to do this is by visiting grocery stores and farmers’ markets in different cities and countries. I especially enjoy looking at the unique fruits and vegetables that I don’t usually find near my home. Here are a few photos from a market we visited in Spain. Do you know what the top picture features? Hint: it’s a fruit. The answer is pitahaya, also known as pitaya. 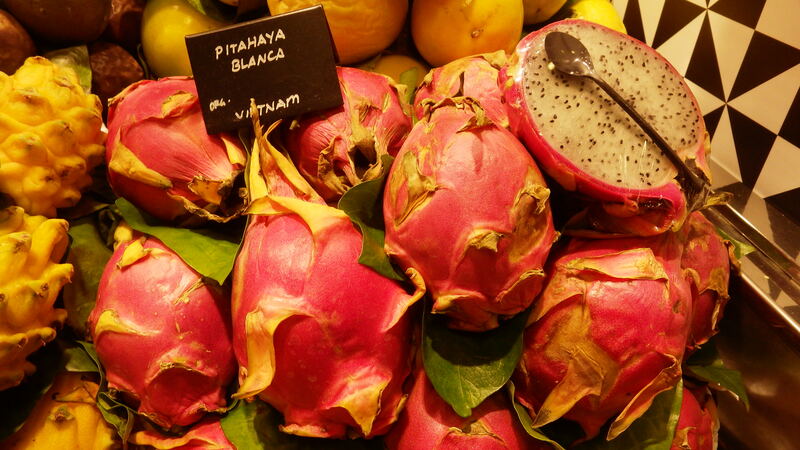 In the United States, it’s commonly called dragon Fruit, and at this market you could get one for a little over $6. There, these fruits are often sliced in half and sold with a spoon for an easy snack on the go. There were a couple varieties and all were beautiful — red ones with white or pink or even red flesh or a yellow variety that had white flesh. And in case you were wondering, yes, I bought one. I was told that the ones with pink flesh were sweeter, but I didn’t get a chance to compare them. My purchase tasted like a combination of a melon and a kiwi, and the black seeds provided a nice crunch. So I decided to do a little research about this amazing fruit. Want to see what I found? The sign at the Spanish market said that their fruit came from Vietnam. 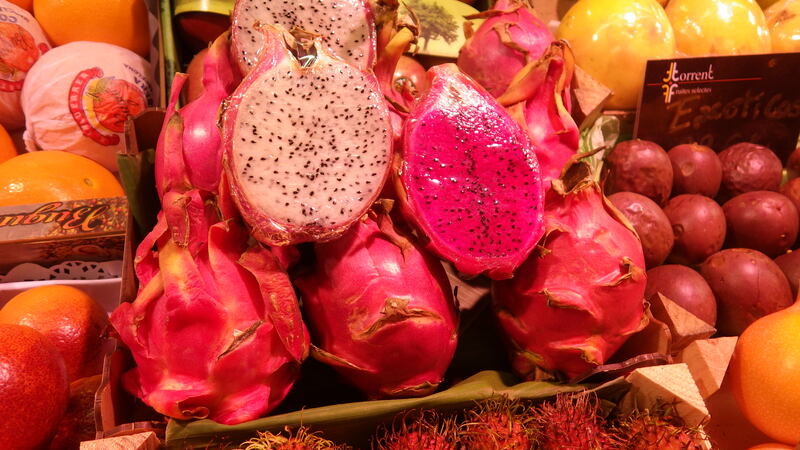 Dragon fruit is commercially grown in South and Central America, Southeast Asia, and Israel. Dragon fruit is technically a cactus and peels easily — like a banana. And just like with a banana, you don’t eat the skin. Nutritionally, 3 ½ ounces of dragon fruit (about ½ of 1 fruit) contains 1 gram of fiber and 9 milligrams of vitamin C. That’s about 15% of the amount of vitamin C that’s recommended daily for women. Dragon fruit with pink or red flesh is also known its lycopene content. Like many other fruits, dragon fruit is low in calories. 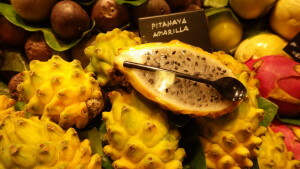 When selecting a dragon fruit, choose one that you know is ripe. You can tell when it’s ripe because it will give a little when squeezed, like a ripe avocado or peach. If it’s firm, then it needs a few more days at room temperature to ripen. When ripe, dragon fruit should be stored in the refrigerator and eaten within a week. Once cut, it should be refrigerated. Dragon fruit can be eaten alone, as part of a fruit salad, or juiced. These certainly gave us nice taste memories from our trip. Now, am I suggesting that you go out and spend $6 for a piece of fruit every day? Not at all. Instead, I like to encourage people to be adventurous with food. Go out on a limb and try something different every now and again. Everyone knows that we should be eating more fruits and vegetables, but the ordinary bananas, apples, green beans, and broccoli can get boring. No wonder it’s hard for people to get the 9 servings of fruits and vegetables a day that are recommended by the Dietary Guidelines for Americans. If you’re going to fill half your plate with fruits and vegetables, you’ll have to do something about variety. Occasionally, try something fun, like dragon fruit. Oh, and if you’re a health educator, consider planning a group trip to a local grocery store. People can look for something that the other members of the group haven’t tried before. Purchasing and/or sharing some unique fruits and vegetables with your clients or students can expand horizons, and who knows, maybe it’ll get them to eat more fruits and vegetables. 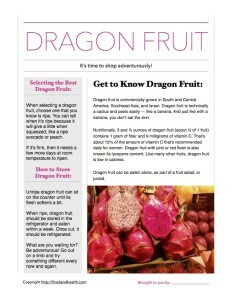 And as a little bonus, here’s a free dragon fruit fact sheet, just for you! 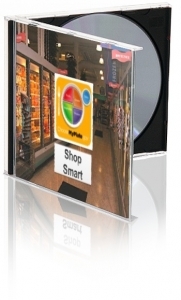 Remember, there are lots of great materials in the Nutrition Education Store!